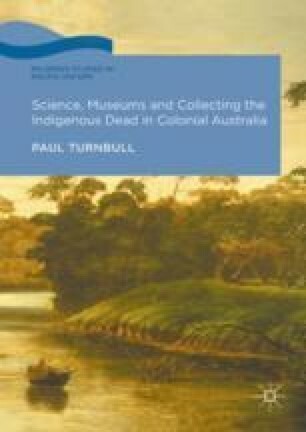 This chapter explores the collecting of Indigenous human remains in Queensland in the forty or so years following the opening of the colony’s vast northern regions to pastoral settlement and mining. The colony’s Indigenous peoples were perceived in scientific circles of this time as pristine types of primitive humankind who were highly likely to suffer the same fate as the Indigenous Tasmanians. This was the context in which Queensland’s museum sought to acquire the remains of the colony’s first peoples as best as its often-stretched resources allowed. As the chapter shows, the museum’s trustees and Charles De Vis (1829–1915), who served as curator from 1882 to 1905 was especially keen to secure the bodies of men and women that had undergone traditional funerary practices which included the smoke drying of their remains. These so-called ‘Queensland Mummies’ were seen by museum personnel and the colonial public as strikingly confirming the short history of the colony as having seen the triumph of European civilisation over primordial savagery. The chapter also examines the anthropological collecting of Walter Roth (1861–1933). An Oxford trained physician, Roth served as a government medical officer in northwest Queensland before becoming the principal administrator of the protectionist regime under which the colony’s Indigenous peoples were forced to live from the late 1890s until well after the Second World War. Roth capitalised on his government posts to produce a body of ethnographic reportage that won him an international reputation by the turn of the twentieth century. He was among the Queensland Museum’s most energetic collectors of ethnographic material. Yet what is less well known is that Roth also pursued anthropometric research and actively collecting skeletal material, some of which he donated to the museum, but for the most part kept for his own ends. The final part of the chapter focuses on Heidelberg anatomist, Hermann Klaatsch (1863–1916), Klaatsch travelled northern Queensland in 1904 with the assistance of Roth and the trustees of the Queensland Museum, during which time he undertook field work with the aim of determining whether Australia was in fact the site of humankind’s origination. As the chapter discusses, Klaatsch exemplifies the complexity of skeletal collectors during the last third of the long nineteenth century second half that he was publicly critical of the treatment of Indigenous Australians by government agencies and Christian missionaries, but ruthlessly dismissive of their distress at his plundering their ancestral burial places.